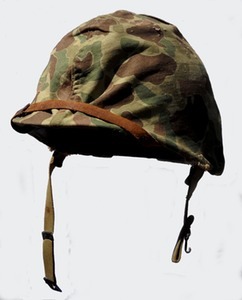 Unique to the combat marine of WW2 is the use of the camouflaged helmet cover. 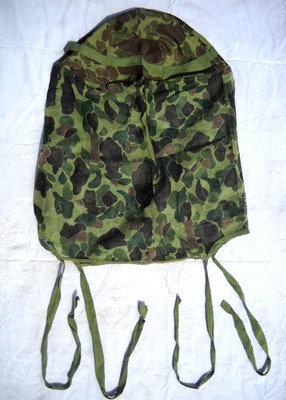 Many contemporary photos taken in the Pacific Theatre of Operations (PTO) show that 90% of the helmets are covered with this piece of combat gear. 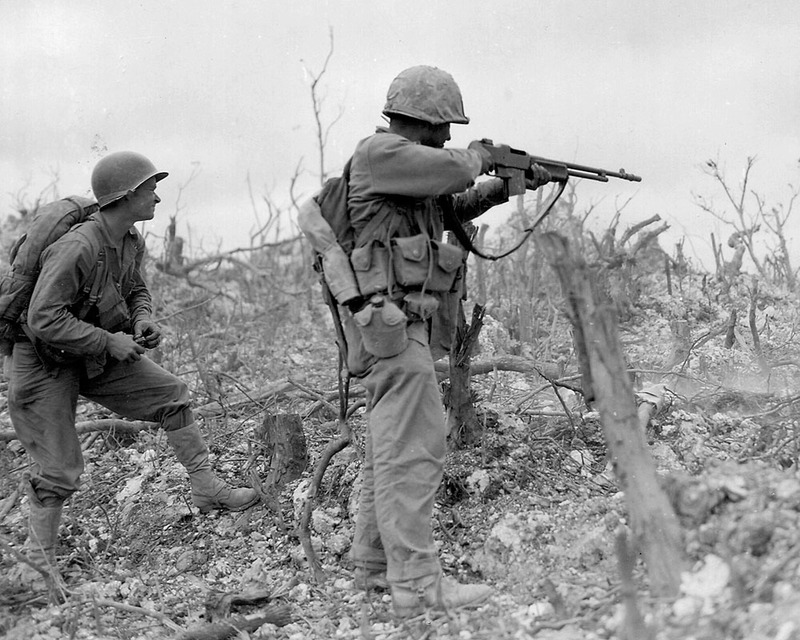 The first offensive action fought against the Japanese was on Guadalcanal in a lush jungle environment. 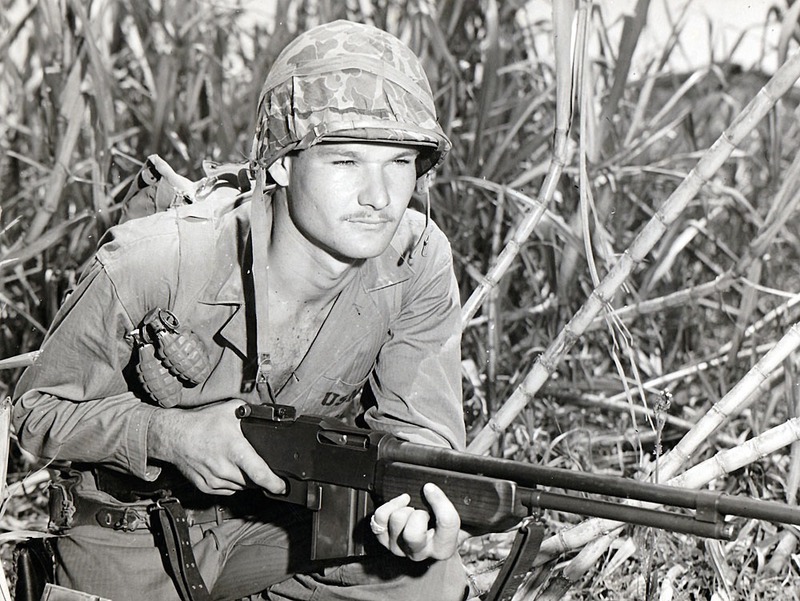 On the ‘Canal the marines wore the newly introduced M1 helmet. This helmet was worn stark naked, and produced a shiny glare when wet. It’s design dates from September 17, 1942. There is only but one design for the helmet cover adopted. 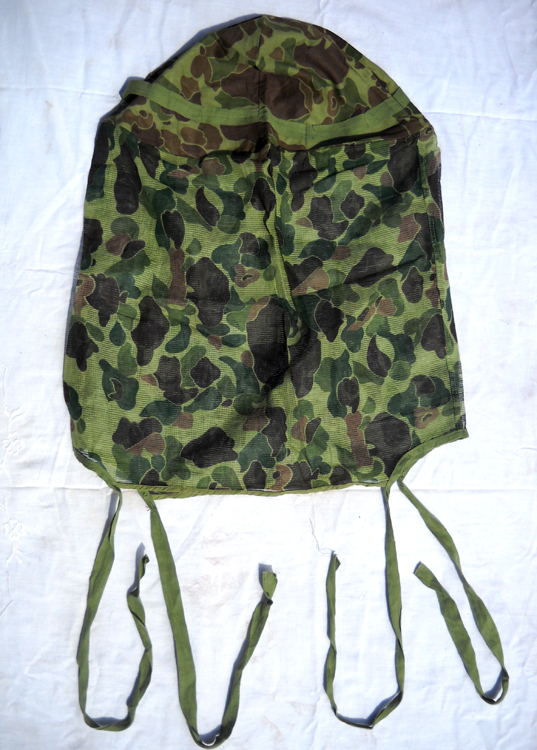 This design called for two halves of Camouflaged Herringbone Twill (HBT) sewn together, each half with two rows of 4 horizontal “buttonholes” on the upper half and one vertical hole in each flap. 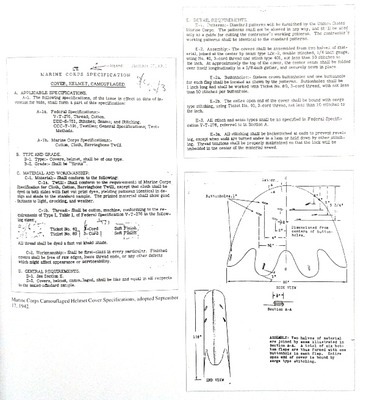 Although not intended to button anything to the cover, these one inch long stitched holes are called “buttonholes” in the original documents. Button holes in crown and flaps. The first batch delivered and issued is with those buttonholes. It's sometimes hard to tell from pictures, but the early campaigns show mostly, if not all, covers have slits. It has long being thought that the early produced covers didn't have slits and that only later productions covers had these added. The document shown above prove otherwise. The base solor on the "green jungle" side is of a light pea-green khaki-ish color. Collectors sometimes refer to these as the “third”type. It was found that, when in motion, using foliage for camouflage made the user more conspicuous. 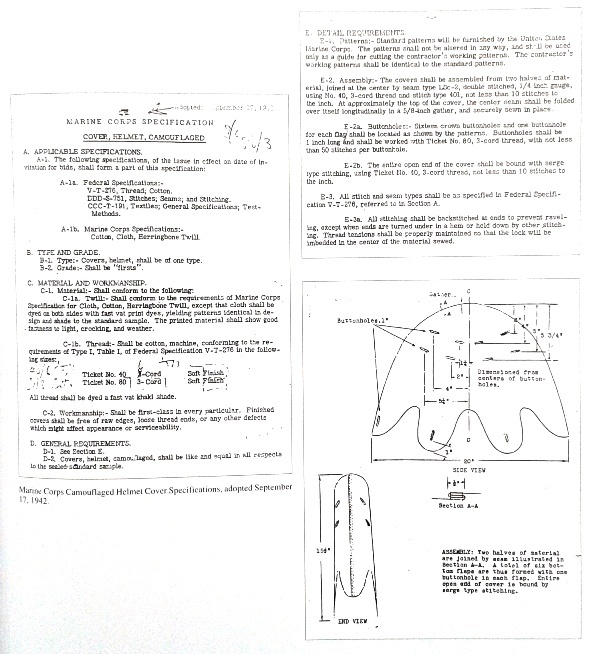 It is most likely that after further field test the production of helmet covers with foliage slits was discontinued some where in 1943. In later operations (1944 and 1945) a mixed use of covers with and without slits can be observed. 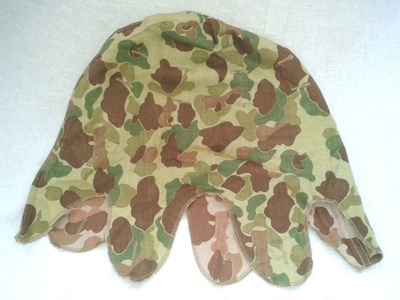 The base color of the "jungle" side is of a darker pea-green color, consistent with later produced camouflage HBT. These are referred to as the "first" type by collectors, although it is really the second version produced. These WW2 productions were used up after the war during the Korean War. When the existing stocks were depleted, new covers were ordered. All these covers are 1953 dated. This new production had the foliage slits in the crown again, but were without the vertical buttonholes in the flaps. 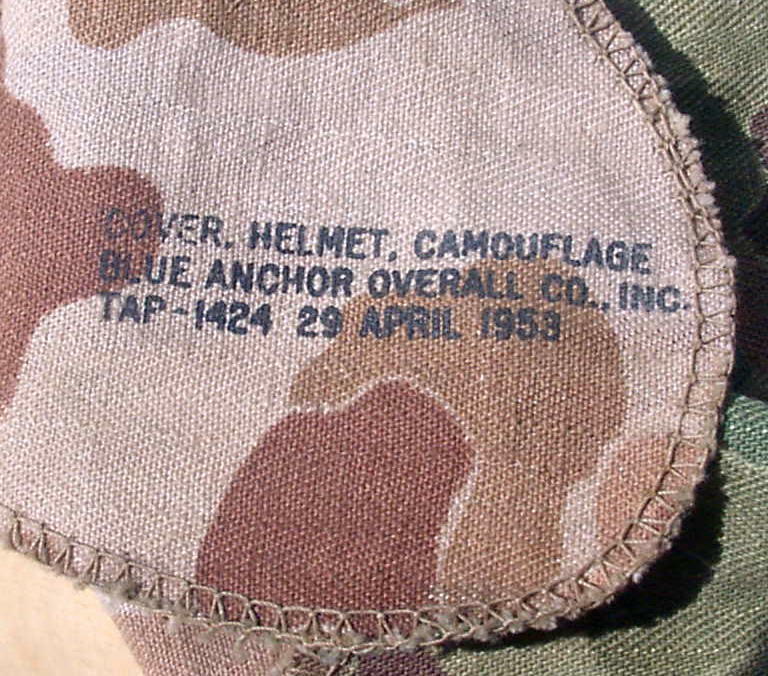 Another myth surrounding the helmet cover is the use of an EGA (Eagle, Globe and Anchor) stamp on the front of these covers during WW2. None were stamped that way and the covers found nowadays are indeed of WW2, or 1953, manufacture, but were stamped in the postwar years (late 50's). Having one in your collection doesn’t prove that the dark spot on a blurry photo is indeed a EGA stamp. No contemporary photo supports any claim as proof of this practice. 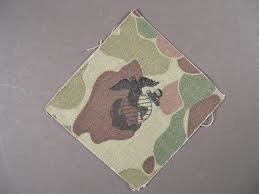 Often this photo is used as "prove" that Marines stamped their covers with EGA's. Although it is a wild bunch, the Marine on the left holding the flag has NOT stenciled an EGA on his helmet, It's just a spot. 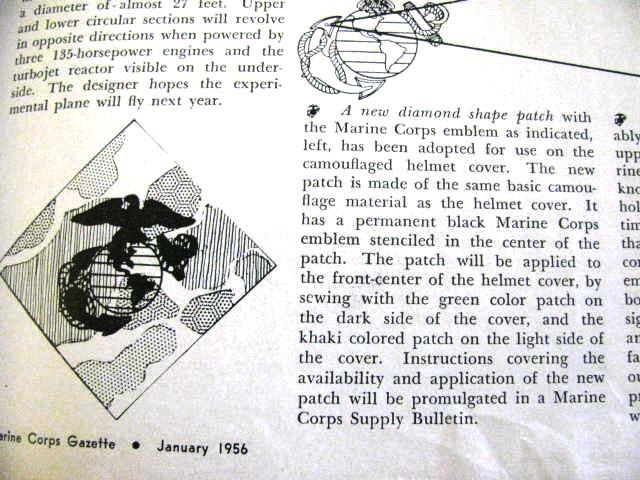 A 1956 directive called for a diamond shaped patch of the same material as the helmet cover stenciled with the contemporary EGA. One for each side (jungle/beach) of the cover. These are rare to find and probably done on a small scale. It is interesting that this practice was done with the old frog skin HBT covers as well as the new cotton Mitchell pattern covers. The following is pure speculation! Producing and sewing on the new diamond shaped patch would require that all the covers in stock (anywhere around the globe) would have been called back to alter them to new standards. Or, to do it locally, if facilities were available. Perhaps it was considered easier and cheaper just to stencil them with the EGA logo. This EGA stamp is solid like the ones stamped on the WW2 utilities, but without the cable and scroll. When this was done is not clear. Fitting the cover was easy, just pull it over the steel helmet and fold the flaps over the edge inwards. Replace the liner, thereby securing the cover. Make sure that the helmet’s chinstraps stay clear between two cover flaps. Since the cover is a little larger than the circumference of the helmet’s edge, it can’t be pulled tight around the chinstraps. 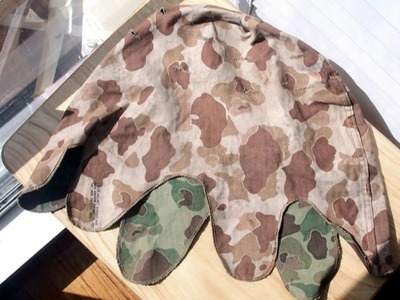 To elevate this marines usually cut a hole for the straps to pass through. 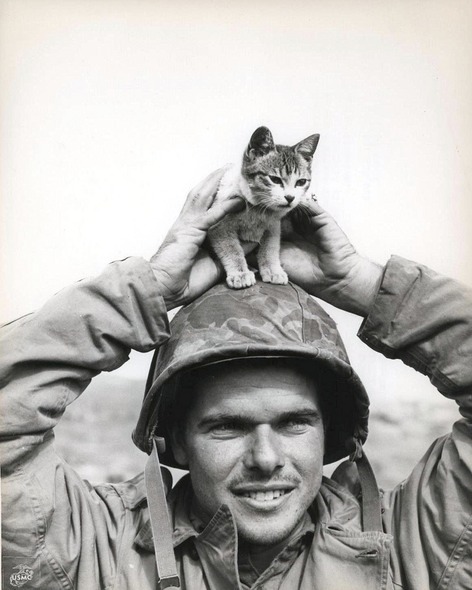 It is interesting to notice that the WW2 marine didn’t buckled the chinstraps around the back of the helmet. Since this was “army”style it was severely frowned upon. Most marines wore them buckled under the chin, or let them hang unfastened. 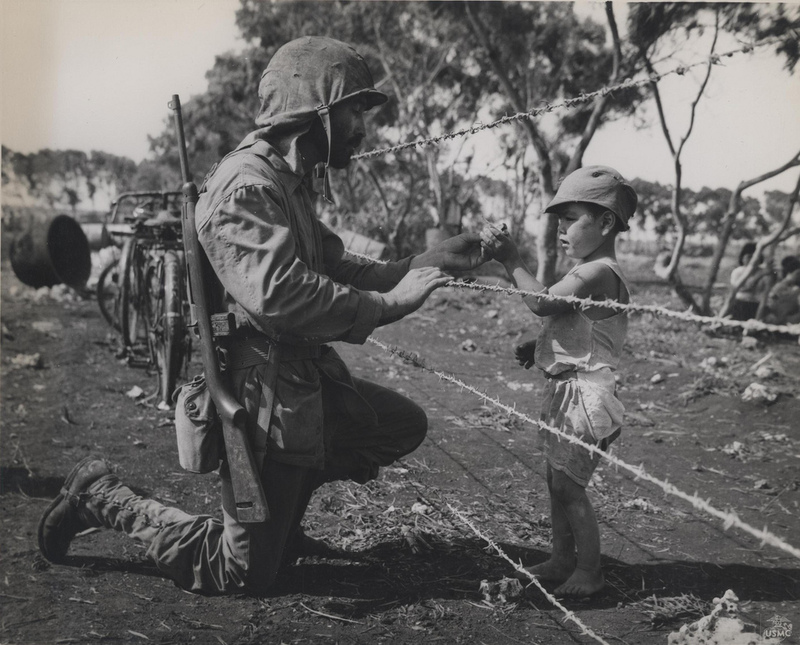 Only during the Okinawa campaign some Marines from the First Marine Division buckled the straps around the back of the helmet. 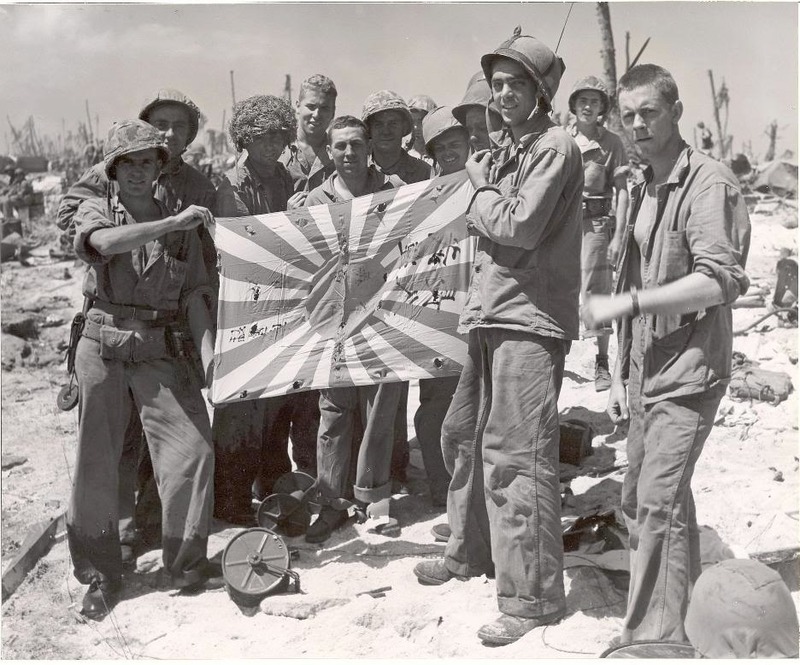 These men are from the 1st Marine Division on Okinawa. Note that they both have their helmet straps buckled "army style". 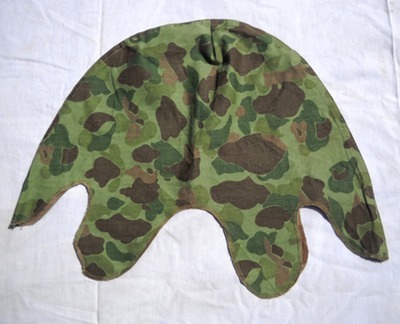 One other style of helmet cover was issued during WW2. Often referred to as the “sniper cover”, it sports a camouflaged face veil. Made of thin cotton this was a non reversible cover printed with the green camouflage scheme. Stitched around the the cover was a green fabric tape for attaching foliage. 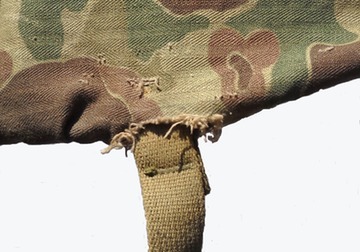 To the edge of the cover was sewn a green camouflaged printed gauze like material, hemmed with tie-down tapes. The sole purpose for this veil was to ward off insects. The tapes were to be secured under the armpits. This practice was not popular and the nets were tucked between the steel pot and liner. Most of these covers were issued to rear echelon troops.